TrafoGrade system allows for continuous monitoring and update of the technical condition and the importance of transformers in the system. The distribution companies in Poland operate several thousand of medium powers transformers, which connect high voltage power lines with medium voltage distribution network. Most of transformers in this group are units with powers 10, 16, 25 and 40 MVA and many of them are older than 30 years. Although they are operated for so long, their technical condition allows them to continue running, which results from the fact that at the time of their design and construction there was tendency to oversize insulation system. 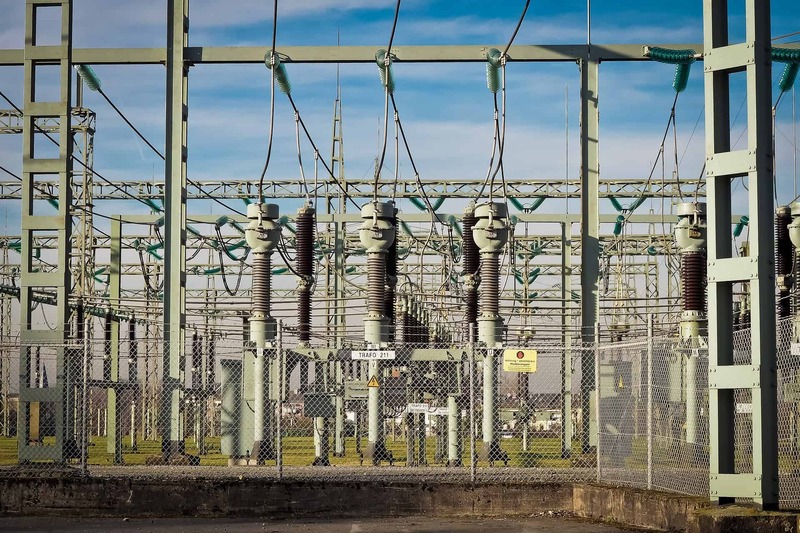 The modern approach to operation of power transformers is based on the complex assessment of transformer’s technical condition and its meaning in a power system. By combining these two factors it is possible to thoroughly determine possibilities of further operation and economical profitability assessment of necessary repairs or unit replacement. 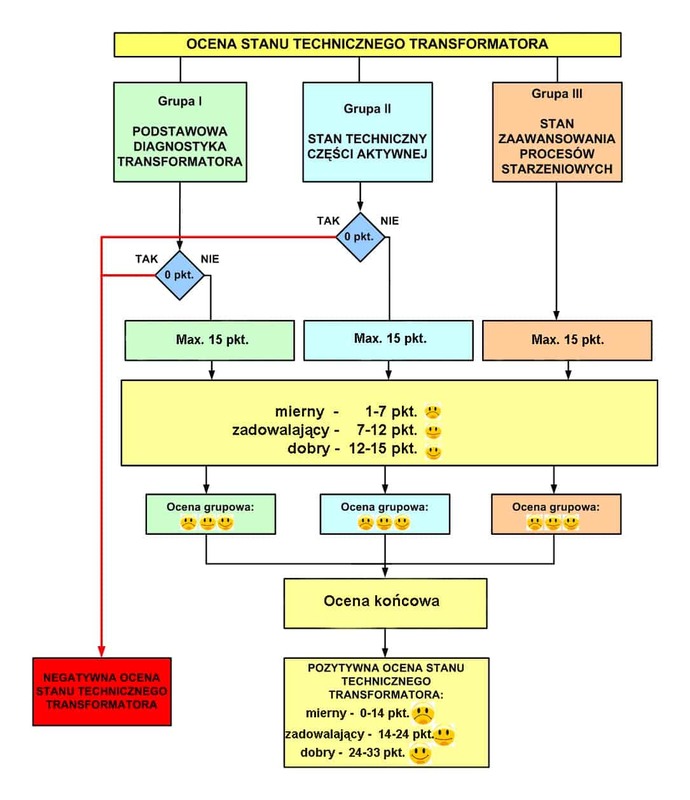 ENERGO-COMPLEX with the West Pomeranian University of Technology in Szczecin and the Opole University of Technology has developed a comprehensive transformer management system called TrafoGrade. 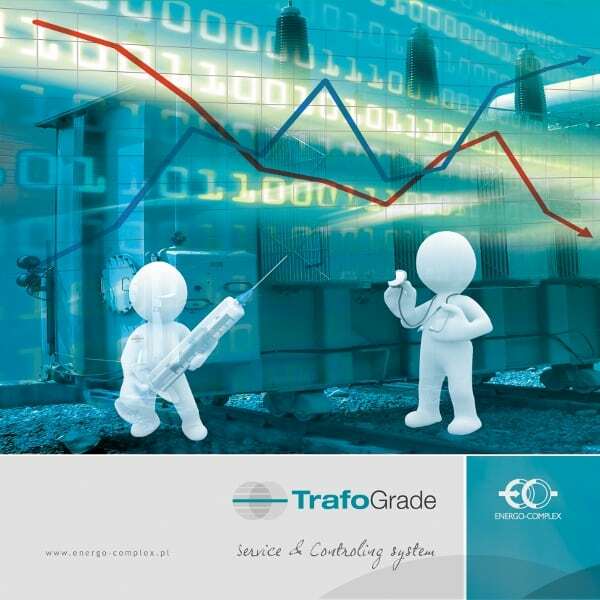 TrafoGrade transformers management system consists of four modules. 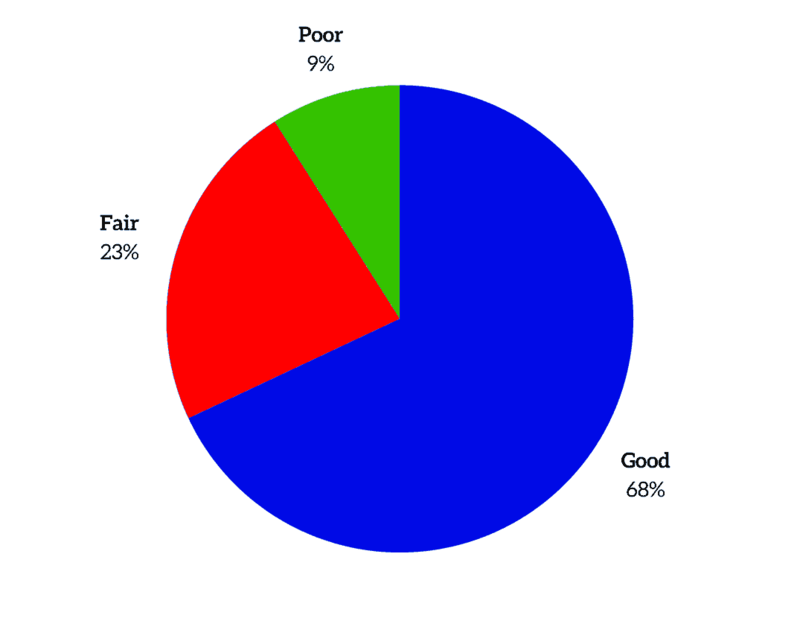 In TrafoGrade system there are points given for each property of parameter used both for technical condition assessment and transformer’s importance in power system. 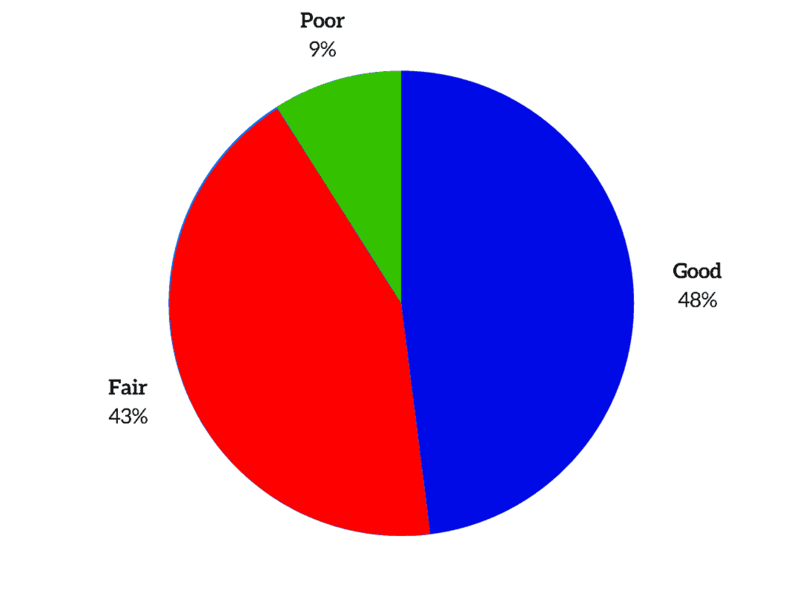 There is three point scale introduced: poor, good, fair. The simple point-based form of technical condition assessment allows to conduct analysis of measurements results not only by engineering staff but also by economical services usually not having sufficient technical knowledge. 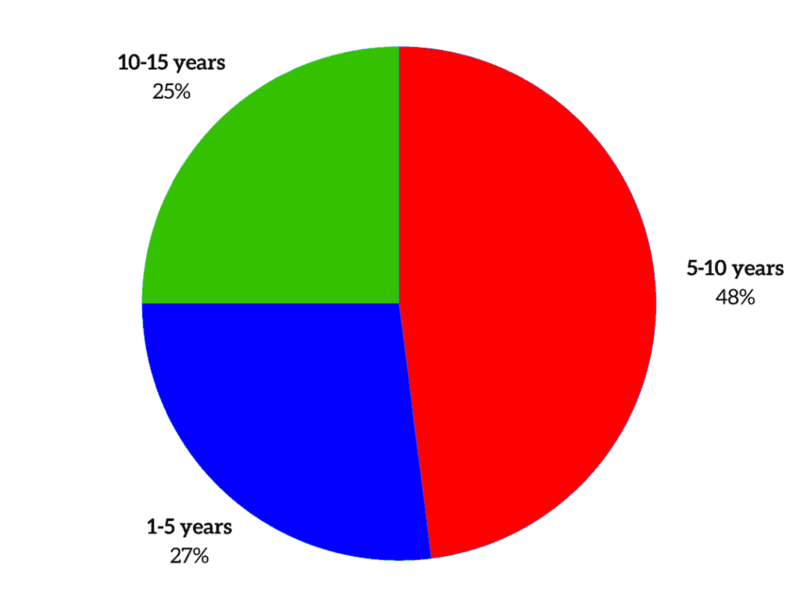 Group III – development of ageing phenomena. Group I contains transformer’s basic properties. Even their poor results have no significant influence on transformer’s ability to be operated and powered. Only extreme cases of very poor technical condition of these properties may lead to switching off the unit. It has been assumed that repairs in this group are technically easy and cheap. For instance this group contains OLTC accessories assessment. Group II contains elements having significant impact on transformer’s functionality. Bad technical condition of any of these elements eliminates the unit from operation and restoring it to proper condition needs considerable financial and organizational efforts. This group contains e.g. DGA analysis, as its negative result leads to switching off the transformer and at least need of internal inspection. In Group III there are properties which are not directly connected with current operation of transformer, but take into consideration expected “lifetime” of the transformer and planning of repairs and modernization. Therefore even negative assessment of any property from this group does not eliminate the unit from operation, however it needs proper repairs to be planned. In this group there are such parameters as age of the unit or physicochemical properties of transformer oil. For the requirement of TrafoGrade system there has been prepared detailed instruction, which contains definitions and values of all parameters and also methodology of preparing the group and final grading scale. backup possibilities of transformers etc. The combination of two issues, very important for the distribution company activity, allows to match the transformer to proper operation group. The figure below shows exemplary results of the assessment of 44 transformers carried out in one of the distribution companies. transformers with special care operation (S). The first group (U) contains units having a very good technical condition or with insignificant meaning for the power system. In these cases costs for current diagnostics can be limited just to periodical visual inspections and DGA analysis of insulating oil. On the other hand, in the group (S) there are included all units with strategic meaning to the system or transformers with poor technical condition.It is clear that in this perspective each group needs to develop separate operating instructions, but the adoption of such a system based on actual operating condition and the importance of the transformer leads to a significant reduction in operating costs of transformers. The final result of transformer’s complex assessment of its technical condition is preparing its operation outlook, individually for each unit. This information is especially helpful for staff managing transformer’s operation, as it allows preparing thorough plan of diagnostics and repairs for next years. The Table presents two examples of operation outlooks prepared for transformers having different technical condition. Physicochemical properties of oil: fair The transformer has high level of ageing processes development in oil and solid insulation. High moisture contents and existing thermal defect accelerate insulation deterioration. Due to decreasing the short-circuit strength and possible appearance of bubble effect further operation is unreliable. Repairs need large expenditures, e.g. rewinding and oil refilling. Physicochemical properties of oil: good No restrictions in operation. 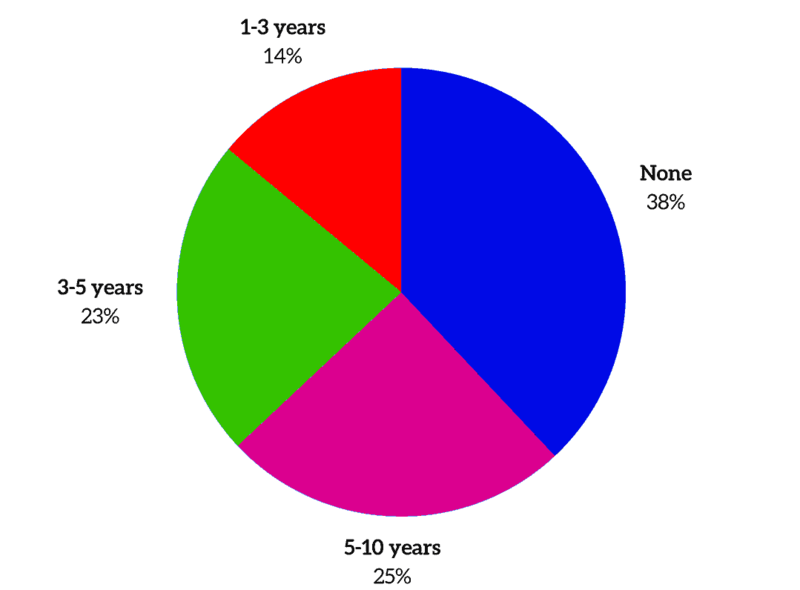 In the next 5-7 years, the possible need for drying insulation. easy access to archive results of measurements. TrafoGrade system computer managing tool will be a program fit to the individual needs of users adjusted to specific character of distribution company. TrafoGrade system has been introduced in one of distribution companies and performed complex assessment of 44 distribution transformers. 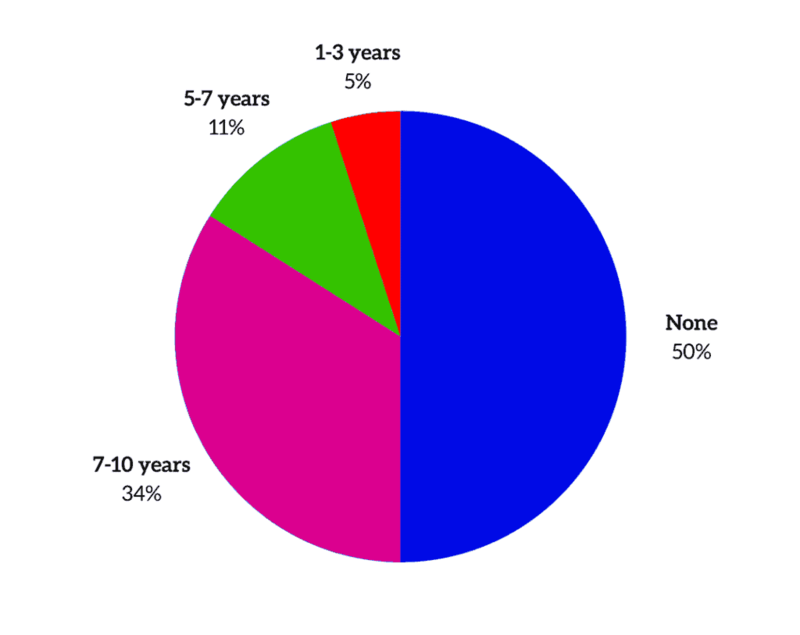 The pie chart presents the operation period of analyzed transformers population. Among 44 tested transformers four units had poor technical condition, 33 – fair condition and seven had good condition. Thorough assessment of technical condition is based on modern high technology diagnostic methods. 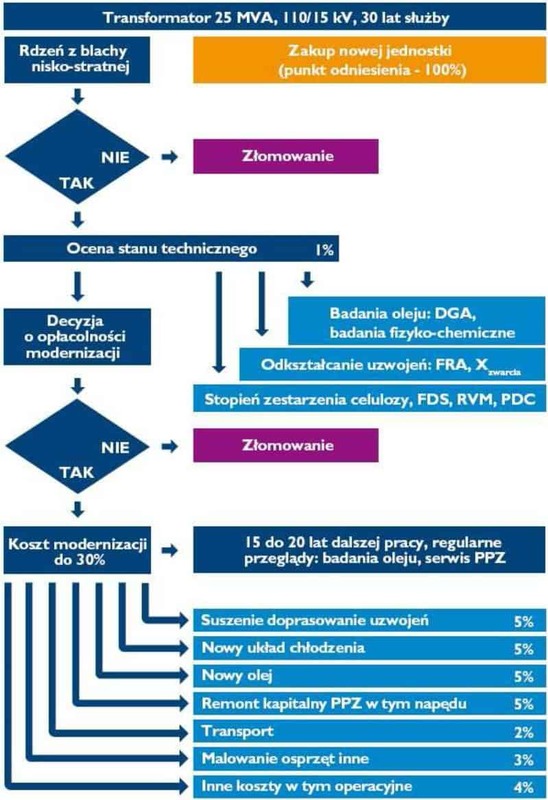 Na rysunku przedstawiono uogólnione dla całej populacji przykładowe wyniki z badania DGA, pomiaru zawilgocenia izolacji stałej oraz oceny odkształceń mechanicznych uzwojeń metodą FRA-VM. 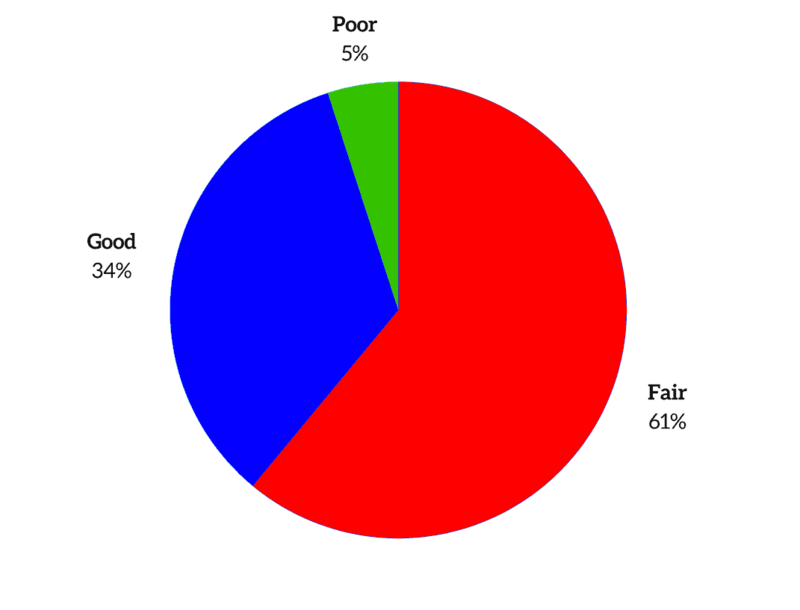 Based on the results, it can be concluded that only a small percentage of the analyzed population of transformers has serious technical problems that may require involving significant financial resources. 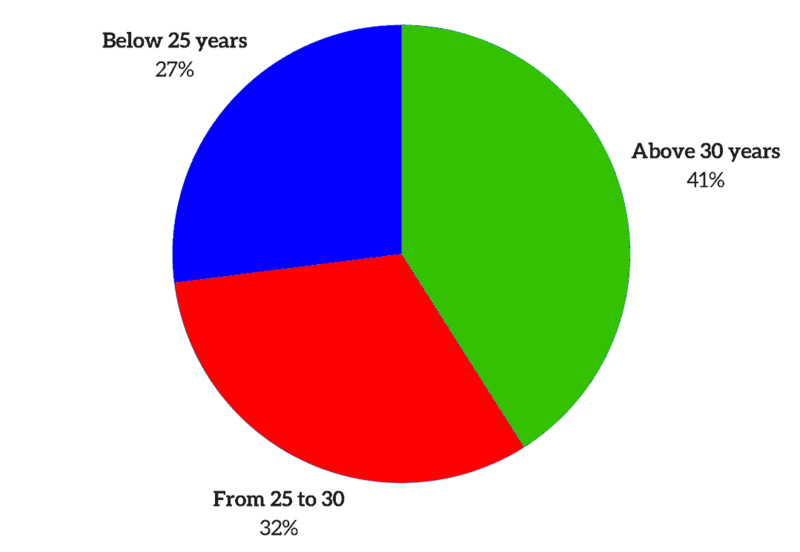 The next figure shows operational perspectives for the analyzed population of 44 transformers. The operation outlook determined on the base of technical condition indicators is the starting point for economical analysis. Integration of all measurement data in a computer system and introducing point based scale for technical condition assessment makes the analysis of results easier and allows to make a decision for managing staff, not having detailed knowledge on diagnostics of transformers. Expenditures spent on repairs and modernization can be optimized due to introduction of complex managing system based on the multi-parameter assessment of transformer’s technical condition. Such an approach to transformers population managing allows to easily catch the proper time, when technical condition of given unit can be significantly improved with relatively low costs involved. The rules for deciding whether to upgrade or repair the transformer can be presented on the example of the transformer 25 MVA, 110/15 kV, which was operated for 30 years in the network with low load and did not undergo serious accidents. The instruction of the decision-making and the estimated cost of modernization is presented in the form of an algorithm. The cost of repairs of such scope is currently estimated at approx. 15-20% of the new transformer value. It is therefore a typical average renovation. But its execution extends the operation of the transformer for the next 10-15 years. The cost of implementing TrafoGrade system is refunded already in the case where as a result of preventive actions there is avoided the failure of only one transformer. By introducing assessment scale and adjusting the operating instructions of transformers for TrafoGrade method standards it is possible to reduce the costs related to periodic diagnostics. Individual approach to the given unit limits test range for transformers that are in operational group U, and allows rationalizing the scope of necessary measurements in the group of N and S.